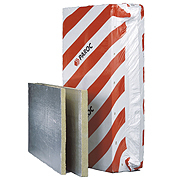 Fire protection slab PAROC FPS 17a is non-combustible stone wool insulation for use as fire protection for steel structures, chimneys, doors, furnaces and ovens. Stone wool insulation has varying fire protection abilities that are largely dependant on the density of the material as well as the used insulation thickness. Generally speaking, the higher the density, the longer the fire protection time. PAROC FPS 17a has a density of ~170 kg/m3. The right product for the application will be chosen based on the system provider's approval. PAROC FPS 17a has ETA approval for fire protection for steel structures. The product is easy to handle and install for different kinds of fire applications. The fire protection slab is faced with an aluminium cover.